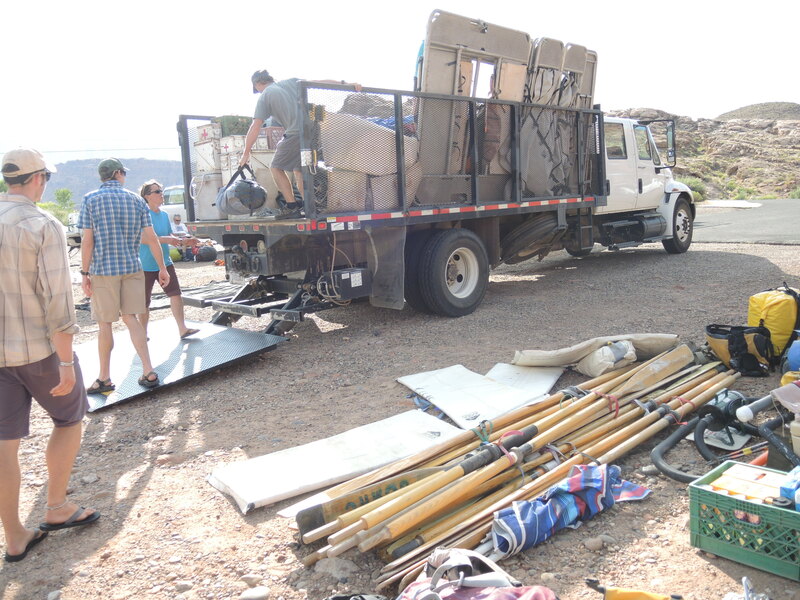 August and September have been busy—we hosted a second Volunteer Day in mid-August, which served as good deadline to stop the perpetual cleanup and focus on getting the mill up and running. 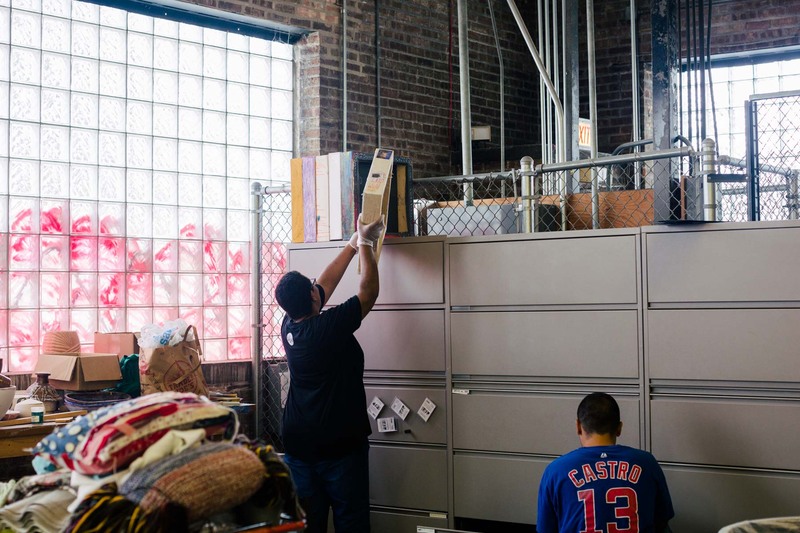 The cleaning and organizing and vacuuming could go on forever, and at a certain point, it’s time to realize that nothing will ever be truly free of dust, things will not always be in their right place, and it’s time to start making work. When I was getting started this summer, I thought it would be six months before any equipment was up and running. But things are moving along a lot faster than I thought they would, and we are working on a first edition of 100 blankets! 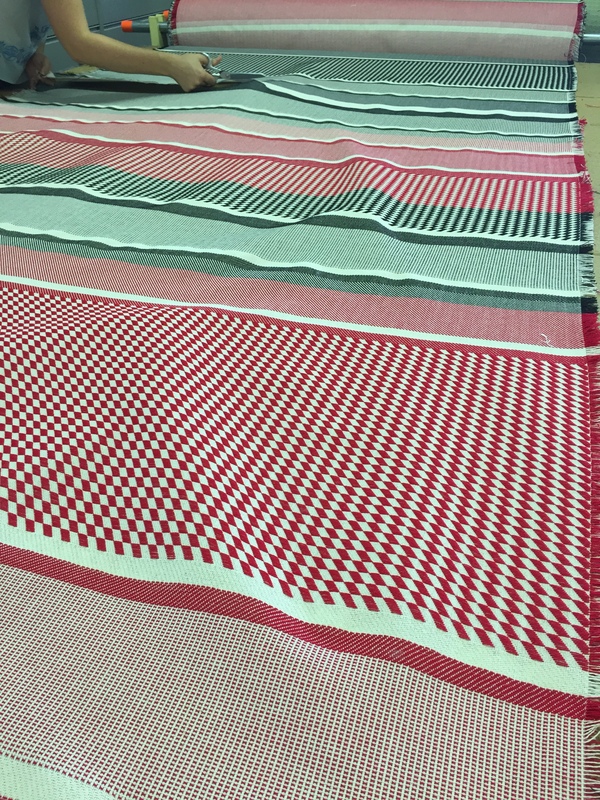 Each one is a little different—the blanket striping patterns are determined by the cones of yarn that were left in the mill, and the weave structures play with the possibilities of the dobby loom and continue with some of the ideas I was working on in my MFA thesis. 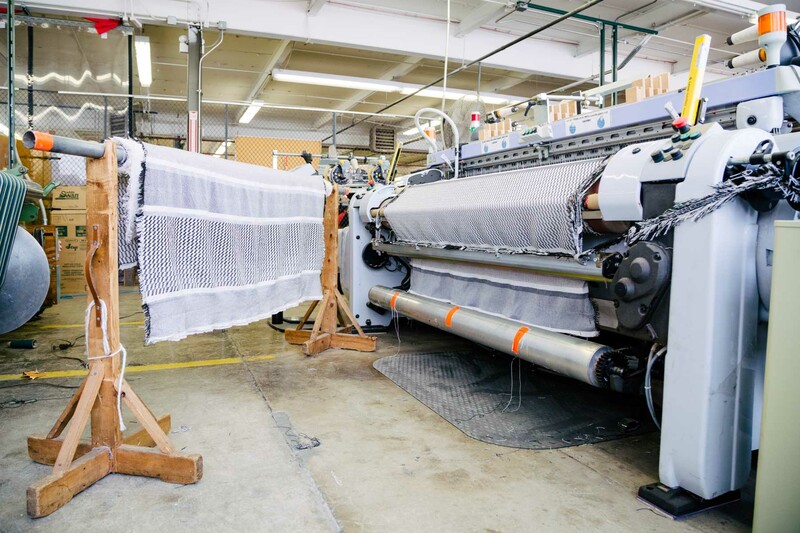 I can’t run the looms during the day, as they’re very loud and disrupt regular Westtown programming. So during the day, I work on any number of non-weaving activities and when the Envision clients go home around 3:30, I turn on the looms. Weaving for 3-4 hours a day on a regular basis is really helping to build a muscle memory and I am getting more and more comfortable fixing problems on the loom (which, as it turns out, is how a weaver spends most of her time). 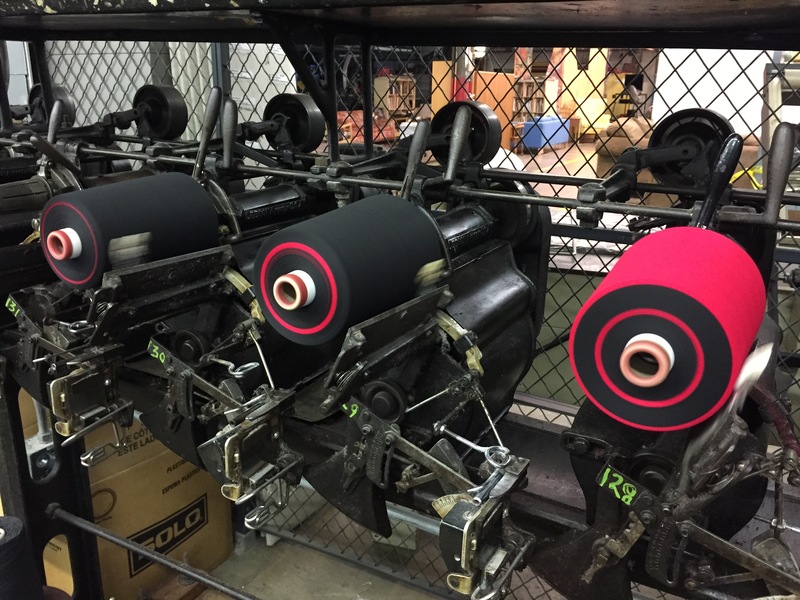 After much hair-pulling and quite a few truly terrible ideas, we’ve settled on a name: The Weaving Mill. 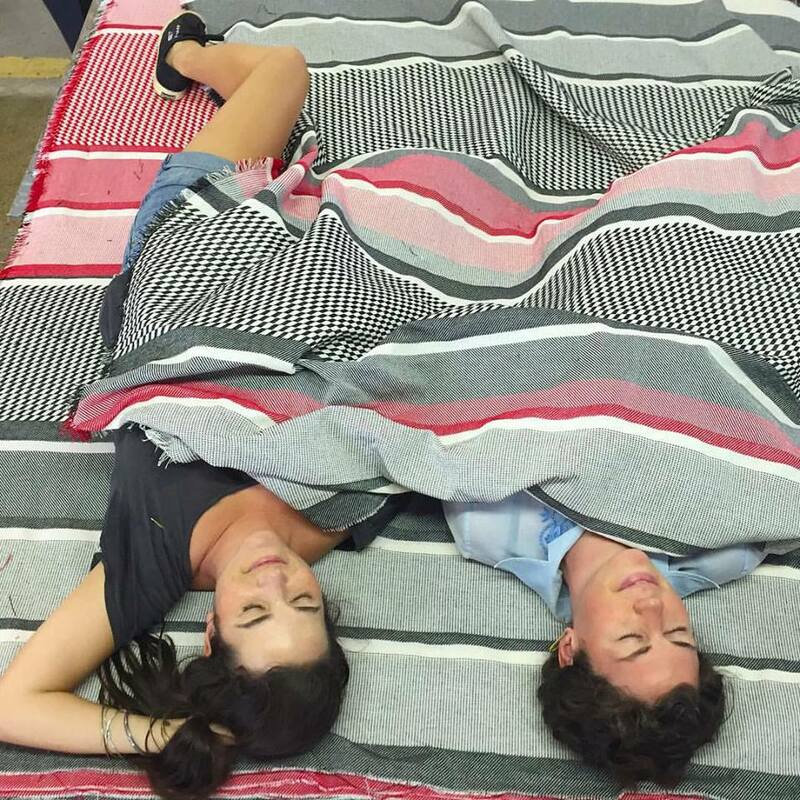 So, please visit www.theweavingmill.com for future updates and blanket sales at the end of September! 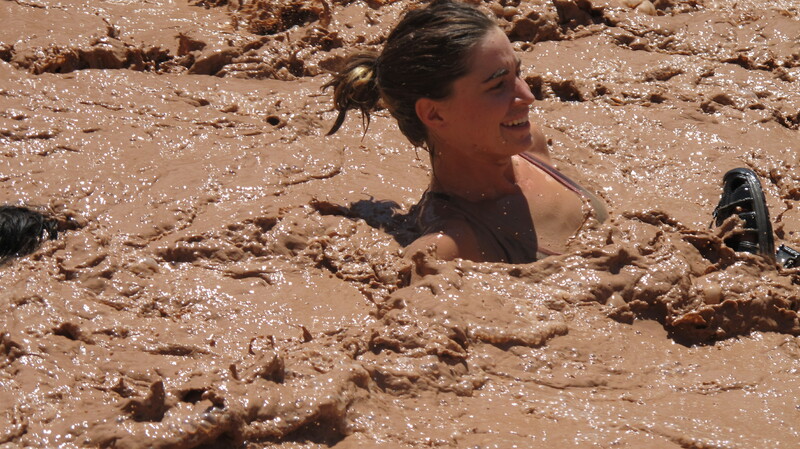 Upon return from my river trip without phone or internet for 16 days, it has been hard to re-enter society. It’s always hard, especially when the magic of place overtakes you and the Grand Canyon works its magic on your mind, body, and soul. It’s always a bit of a culture shock to try and explain where you have been, what you have been doing “down there” to those who haven’t had the opportunity to see it themselves. But I’ll do my best…. The beginning of a trip always starts with the gear. Piles and piles of gear. 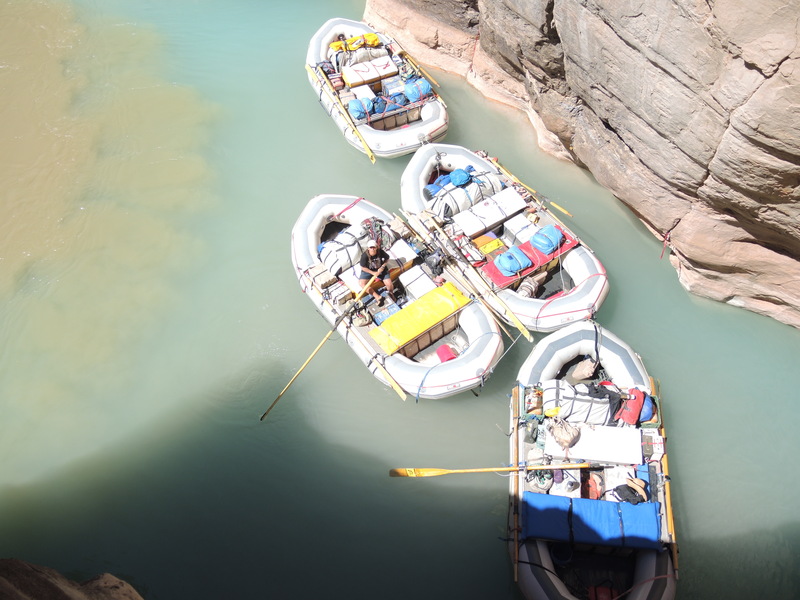 Boats, frames, oars, dry bags, rig bags, coolers full of food, dry boxes full of food, science equipment of all shapes and sizes, and of course, 5 guides– armed with a range of skills– cooking pancakes and bacon, catching fish, righting upturned boats, hiking into the hot desert sun in order to find the most magical waterfalls in the most magical places possible, and of course, rowing boats. 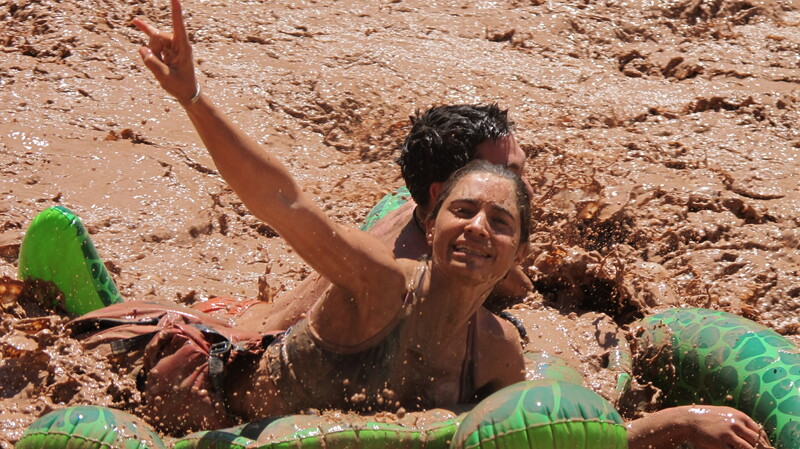 This is no afternoon tubing adventure. 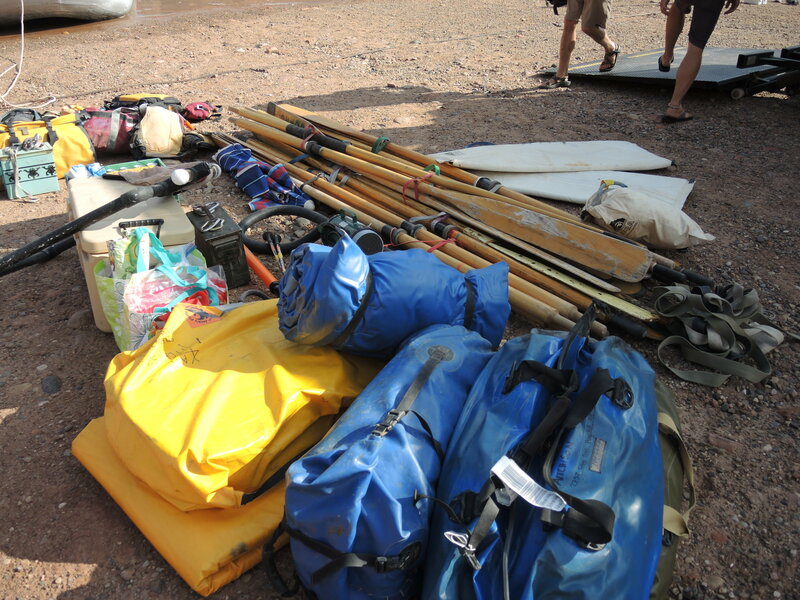 This is a 16 expedition style trip and everything we need for 16 days fits onto 5 18 ft. oar boats. These boats are heavy– a few thousand pounds each–and yet they float, and sometimes even flip over. 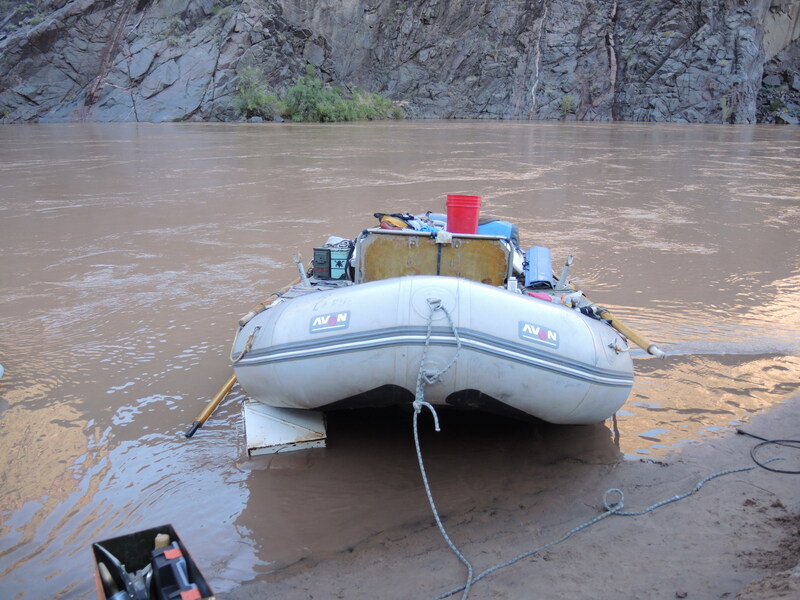 We launched at Lees Ferry, a historical crossing point for the Colorado River and the only access point for vehicles until 226 miles downstream at the takeout, Diamond Creek. 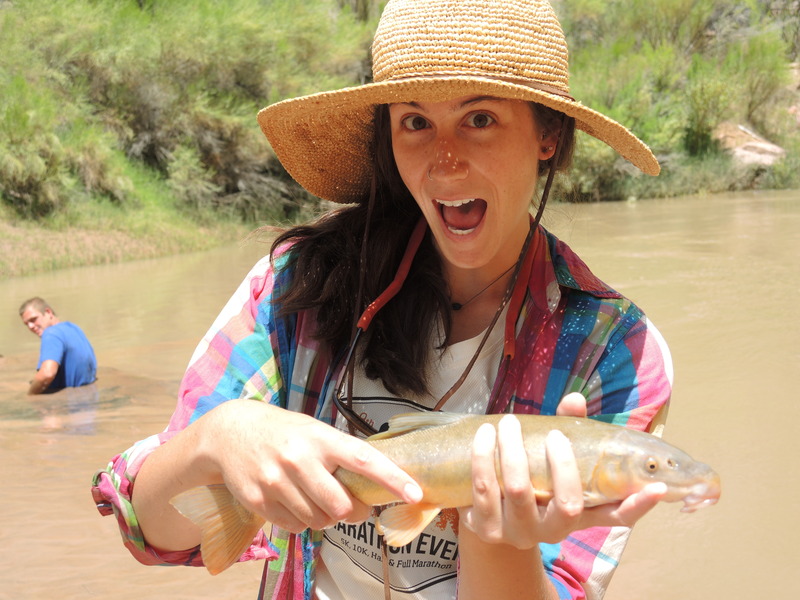 Technically this trip was scheduled under a science permit through Grand Canyon Research and Monitoring, so that means that we had a mission to collect data about fish, aquatic insects, and bats– a food web trip. 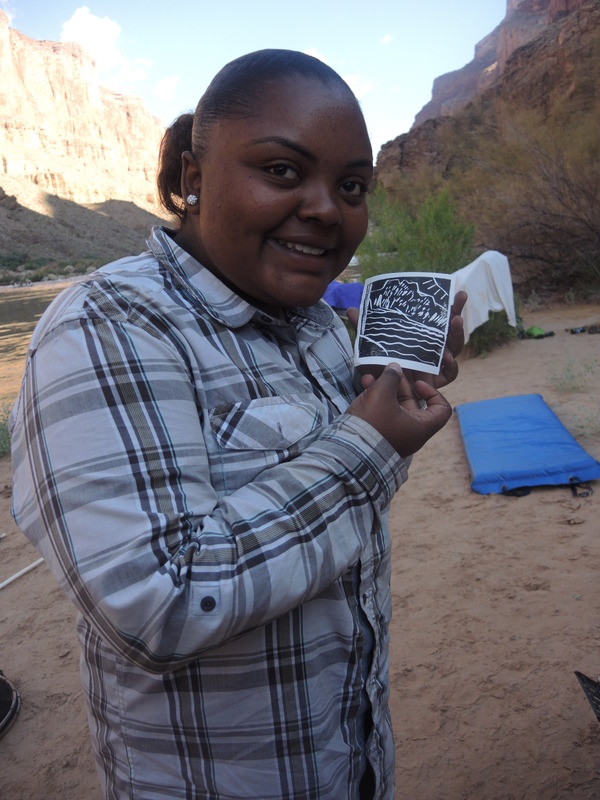 Our passengers– youth from around the country interested in adventuring and science and of course, the Grand Canyon. 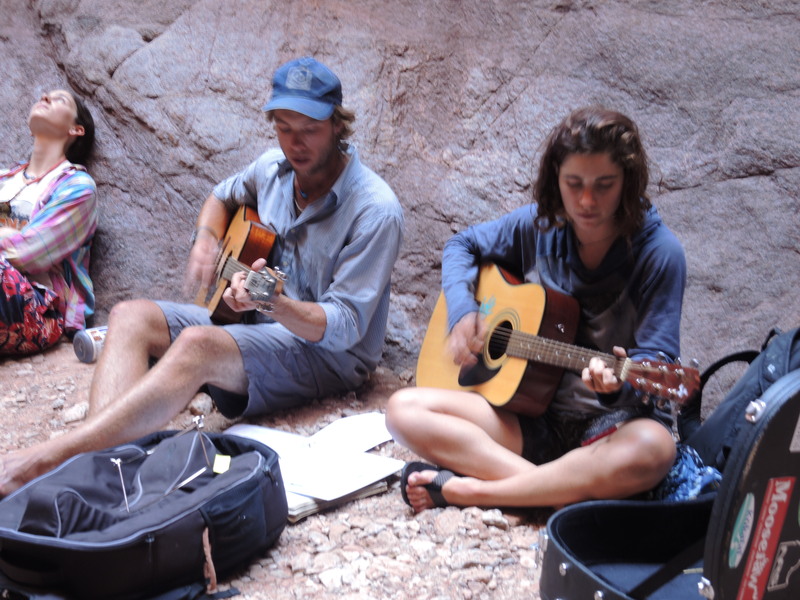 Our role as guides- to mentor youth and play to our own strengths in order to inspire curiosity in the place and encourage the idea of stewardship. For me, that meant using art, music and silliness to remind youth that its ok to play, to be a goofball, and interact with the landscape in many different ways including adventuring, making art, writing, and simply reflecting at the power and beauty of being disconnected from the fast pace societal norms encourage us to take. Being at Lees Ferry can sometimes feel like being a part of a circus. There are boats upon boats upon boats, motor rigs, oar trips, private trips and commercial trips. Fisherman going upstream, rafters going downstream. Just a mess of people and noise and excited preparation as everyone prepares for their own personal adventure. The best part of Lees Ferry? Pushing off from shore and leaving it all behind… knowing that 16 days later, you will come out the other end a changed individual, part of a new tribe, on an adventure that can never be repeated, no matter how many times you do it over. 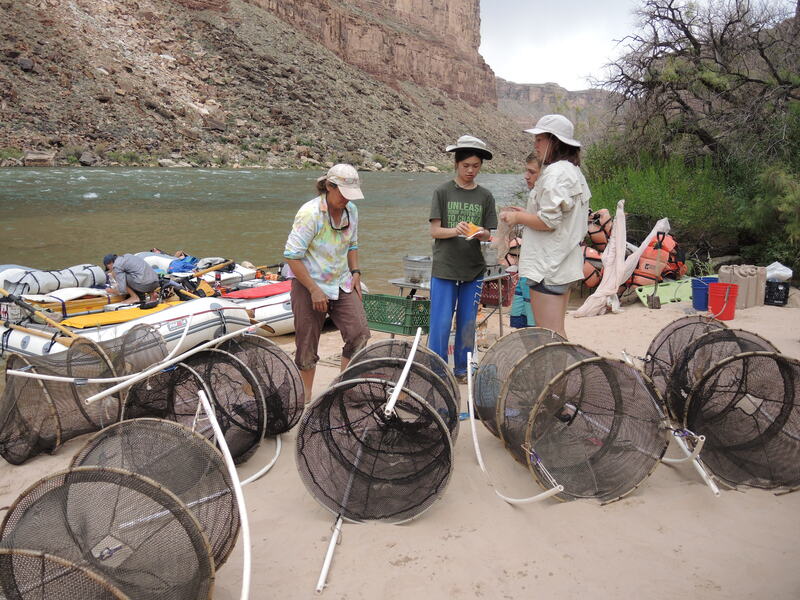 With the first night’s camp comes the first opportunity to do science- Setting up hoop nets catch fish, setting up light traps to catch bugs and setting up the bat detector to see what species of bats hang out in the upper reaches of Grand Canyon. 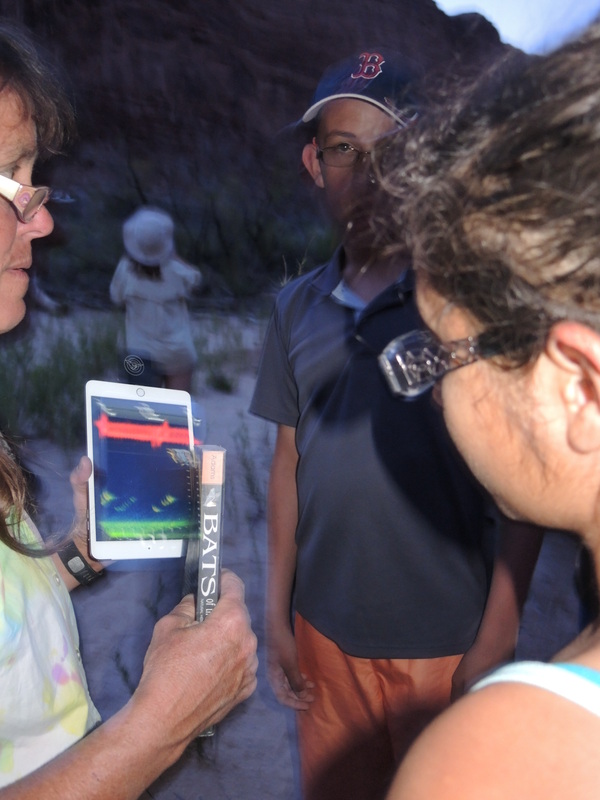 These are tasks that happened every night of the trip– to collect data along the river corridor about different species that rely on aquatic insects for food. 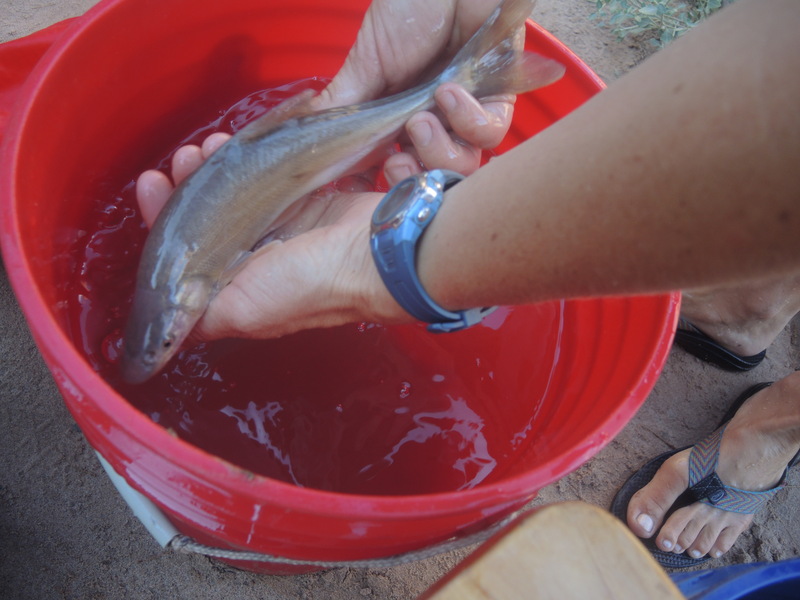 After the science and camp routine had been established- the trip continued as any good river trip should. Boating, hiking, looking at cool things in cool places, drinking water till our insides hurt, playing, and learning about all things Grand Canyon. 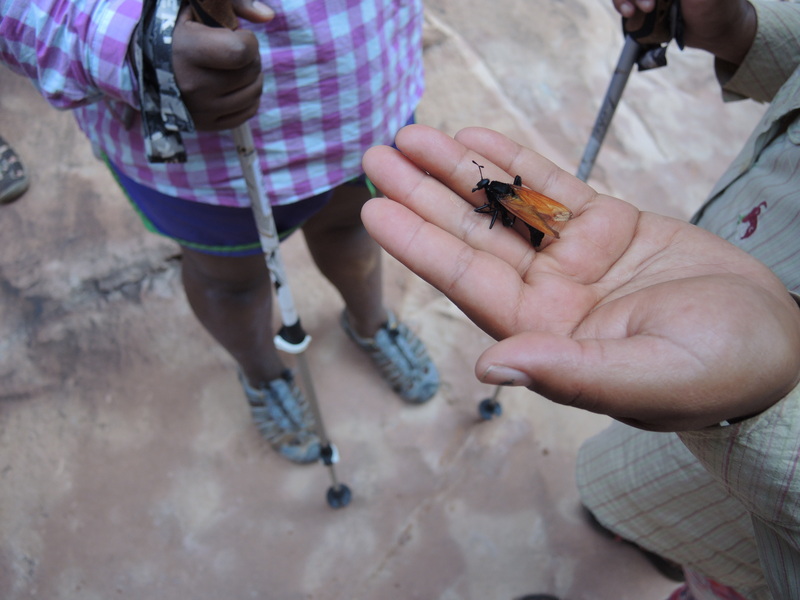 Eric, our resident entomologist, showing everyone the bug diversity of side canyons vs. the main stem. 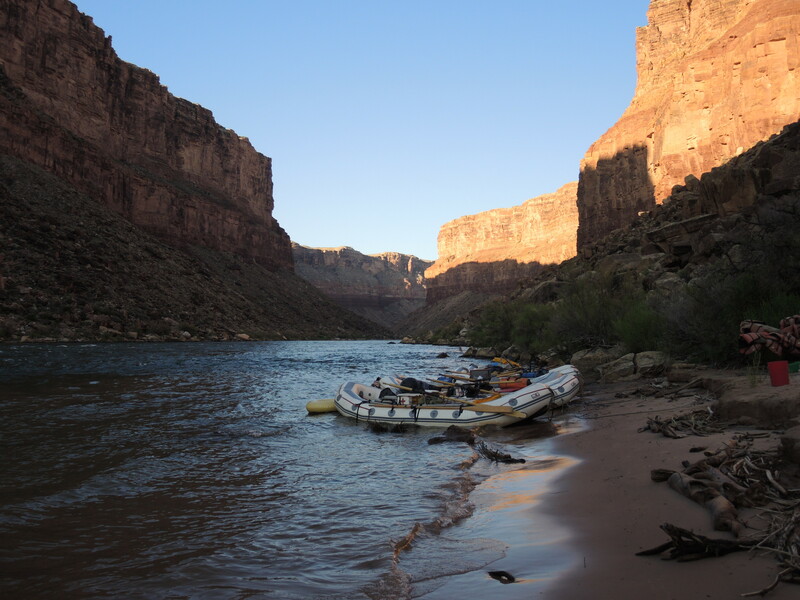 Moving downstream we talked about how the artificiality of Glen Canyon Dam (upstream of Lees Ferry) effects bug diversity in the main stem of Grand Canyon and how the side streams flowing into it have a much greater diversity due to their more natural cycles and flows. 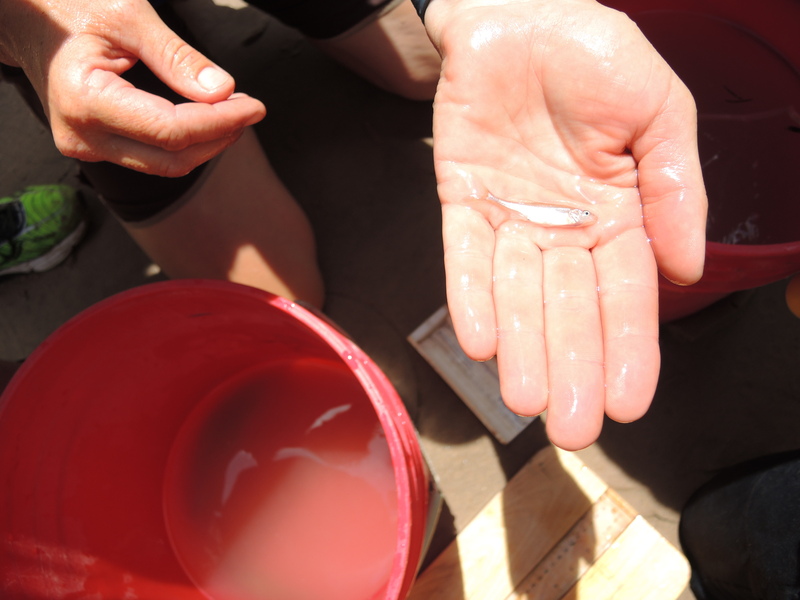 We talked about the cold clear water that flows through Grand Canyon and the effect that has on the native fish, which evolved to survive in the warm muddy water that used to flow through Grand Canyon pre-dam. And we talked about the mysterious night fliers, the bats– and how little is actually known about them but how cool and crazy their lives are. 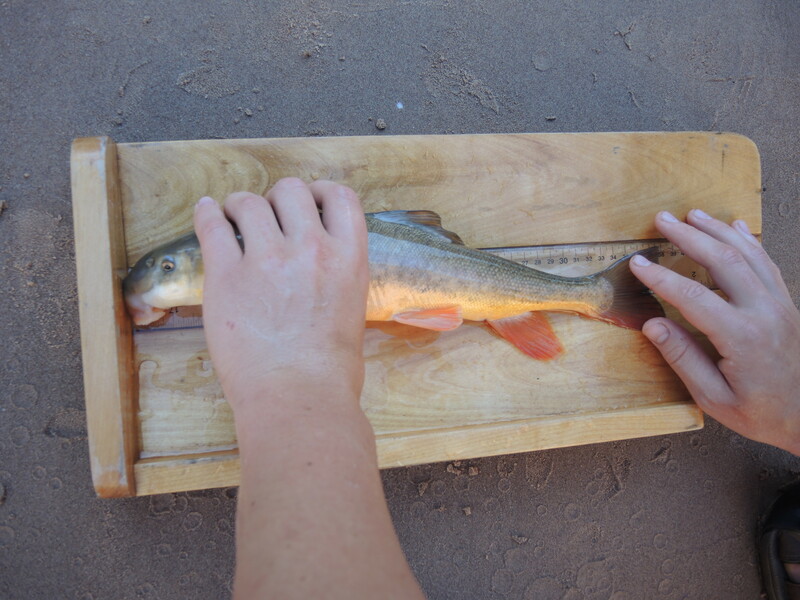 Scanning Humpback Chub (native and endangered fish) for pit tags! Then it was time for art! 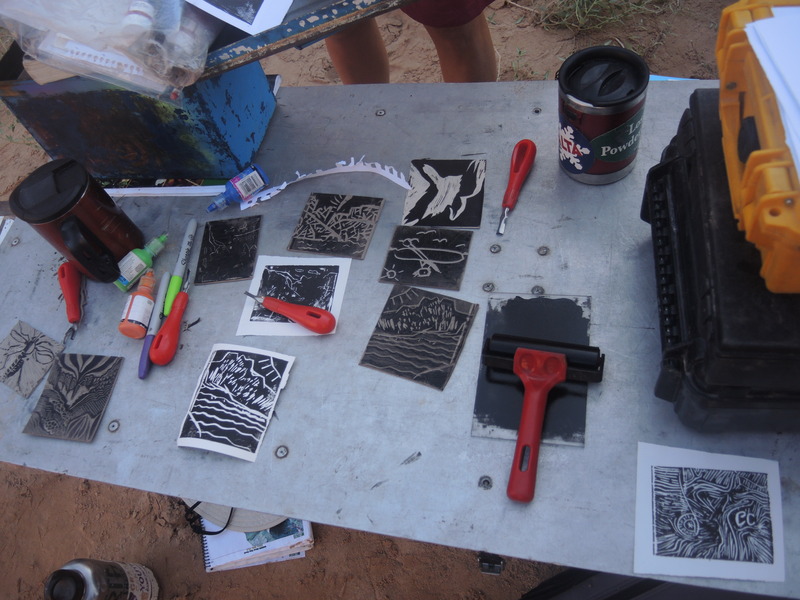 As a printmaker, I can’t just let a river trip go by without introducing printmaking and talking about the importance of art in relation to Grand Canyon. Painter Thomas Moran made huge contributions to the preservation of America’s first public lands, Yellowstone and Grand Canyon National Parks because of his paintings of these iconic vistas. Without his paintings, Congress would not have been able to grasp the grandeur and uniqueness of these places and we have him to thank for his role in saving these localities for posterity. In addition to Thomas Moran, I also like to mention Everett Ruess, a young adventurer and artist from the 1930s who traveled all around the southwest making woodcuts and selling and trading them along the way. His black and white imagery of southwestern landscapes is now some of the most celebrated in the area and his letters home about this experiences traveling through the wilderness are poignant and thought provoking for any age. (he was only 16-19 at the time all of this occurred). But you can’t just talk about art, you have to make it too! 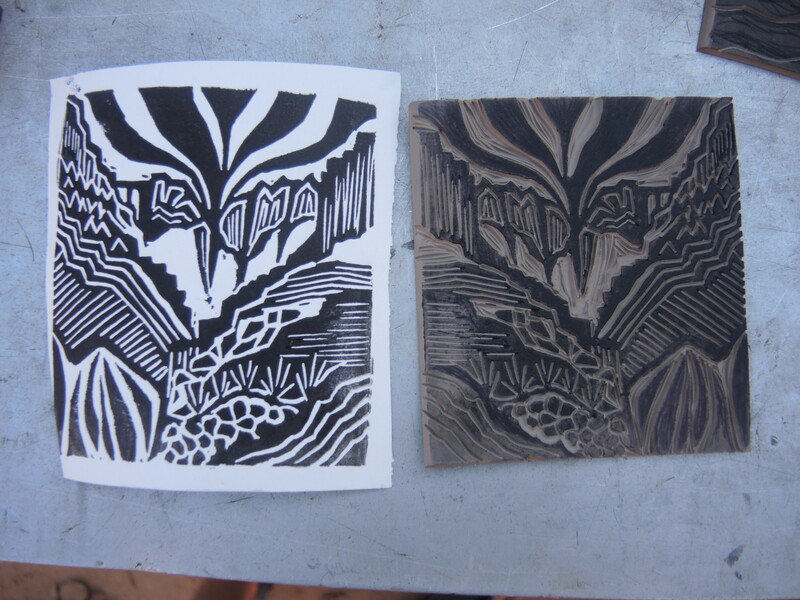 And so we busted out the block print kit and got to work engaging with the landscape in a different way than science allows… a more personal and reflective time to observe the place in a way of your own choosing. 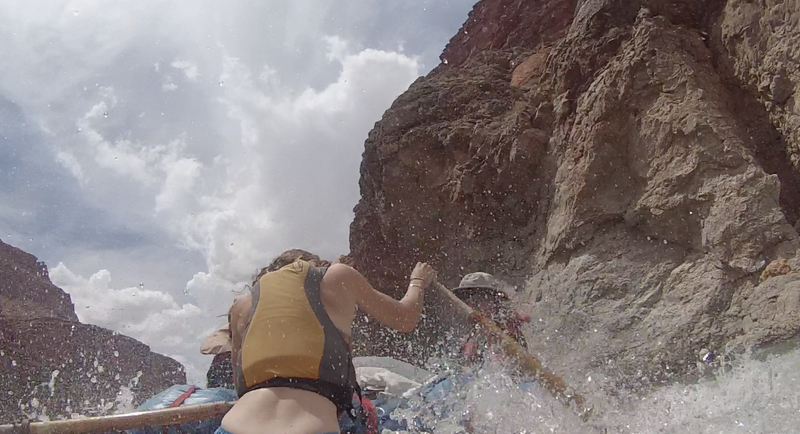 And of course it wouldn’t be Grand Canyon without some of the biggest whitewater in North America. It’s all a part of the adventure! 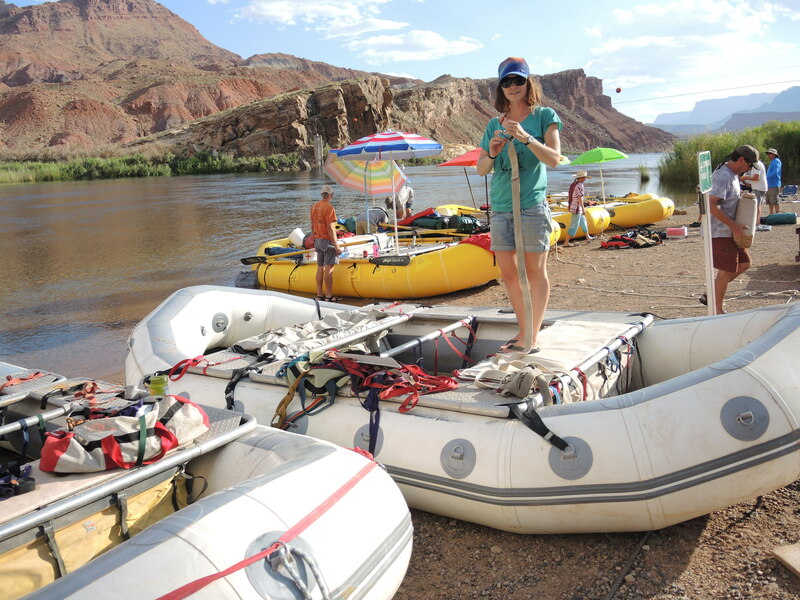 All together, we took to groups of kids down the river– one group came with us from Lees Ferry to Phantom Ranch, where they hiked out and another group of kids hiked in and came down with us to Diamond Creek (the takeout). 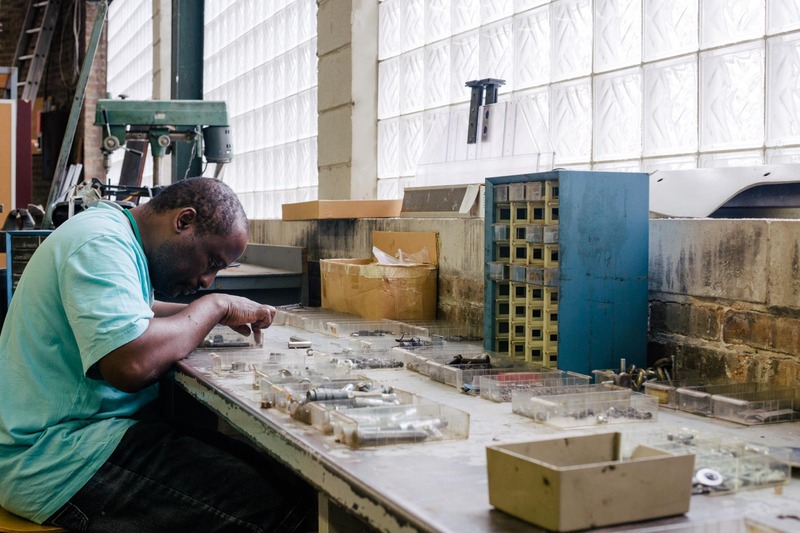 We were able to combine art and science in such a way that it became a part of our lives down there, something that happened as naturally as the turning of morning into night. 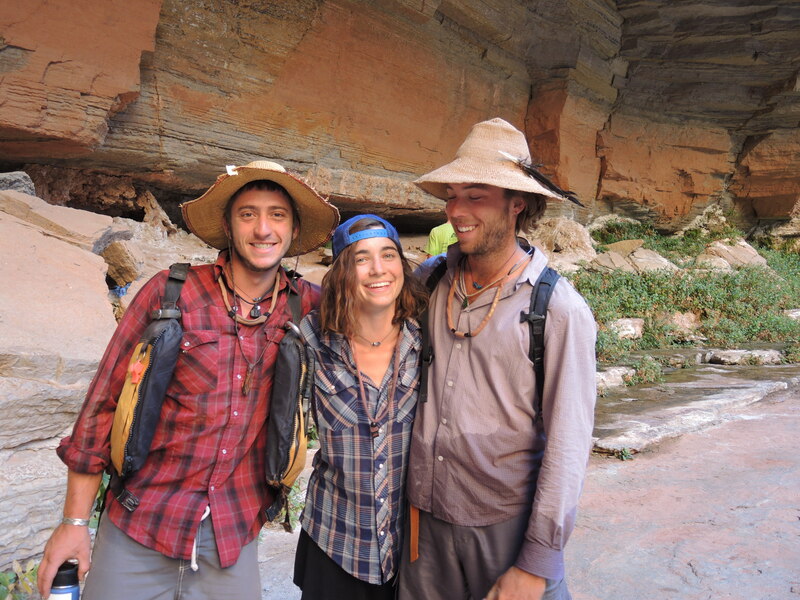 It was incredible to make Grand Canyon our home for a few weeks and to let all the aspects of the fellowship mesh together in a very natural way. 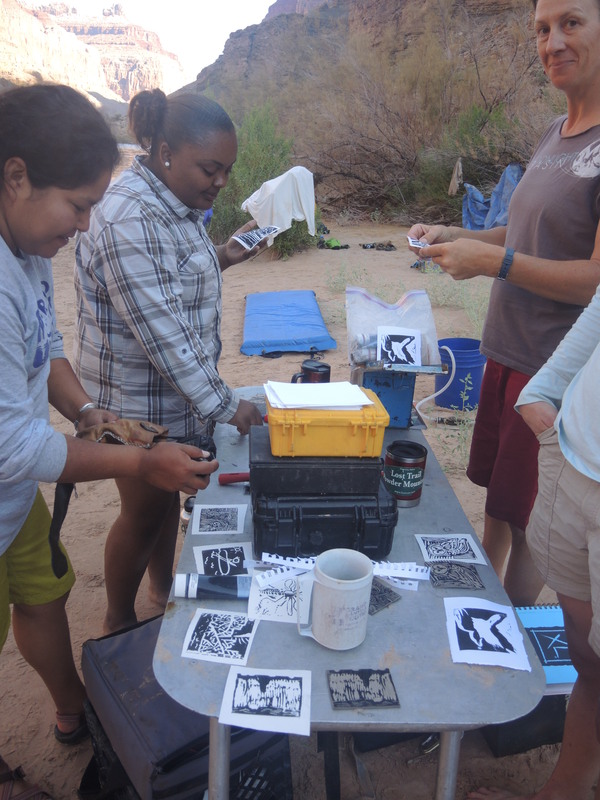 It felt good to show the youth that it was possible to be and artist and a scientist and a river guide, and that ultimately, these paths are not mutually exclusive but instead mutually inclusive and better off that way. Oh man, what a trip!